This Butternut Squash, Goat Cheese & Cranberry Quinoa Salad is an easy to make vegetarian quinoa salad that makes the perfect fall and winter lunch! Hey Cooking Quinoa readers! My name is Monica and I blog over at Mocha and Moccasins. 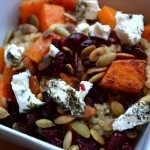 I’m thrilled to share one of my favorite fall quinoa recipes with you today. But just before we begin, allow me introduce myself. I’m a 20 year old gal who’s obsessed with great food, from sweet treats to healthy dishes, you can find a bit of both on my blog. I also blog about fashion, beauty and everyday things I love. If you love roasted butternut squash, sweet dried cranberries, and tangy goat cheese, you’ll love this recipe I’ve created for you today. Let’s talk fall flavors: squash, pumpkin, turkey, sage, cranberry, apple… Fall is hands-down my favorite time of the year for food (well, after chocolate feasts around Christmas time, but that’s a given). This dish is a pleasant combination of many of the above flavors and it takes less than half an hour to prepare. Start by peeling and cutting up your butternut squash into small pieces. After you add extra virgin olive oil, sage, salt and pepper (to taste), you’re ready to roast for 15 minutes, making sure to flip halfway through. While the squash roasts, go ahead and prepare your quinoa. By now we should all be quinoa cooking experts, right? It’s a simple 2:1 ratio of water to quinoa that you bring to a boil (detailed directions below). Now that we have our squash and quinoa cooking away, it’s time to roast the pepitas on a pan, just for a few minutes until they have slightly browned on each side. Slice the cranberries, cut the goat cheese into chunks and you’re ready to assemble once the squash and quinoa are done. Finally, finish off with a pinch of two of salt and pepper to taste and a squeeze of lemon juice for a citrus tang to tie all of the flavors together. Butternut Squash: Preheat oven to 425F. Peel and seed butternut squash. Cut into small chunks of similar size for even cooking. In a medium sized bowl, mix with extra virgin olive oil, sage, salt and pepper. Once the oven temperature is ready, roast the squash for 8 - 10 minutes. Toss. Roast for an additional 5 – 8 minutes until toasted brown. Set aside. Quinoa: Rinse quinoa under cold water. Add to small saucepan, along with water and bring to a boil. Set heat on low and allow the quinoa to simmer, covered, for 15-20 minutes (until all liquid has been absorbed). Remove from heat and fluff with a fork. Set aside to cool down. Add-ins: Set small pan on high/medium heat. Toast the pepitas for approximately 2-3 minutes, or until they are toasted brown. Stir them around to avoid burning. Chop up the cranberries and goat cheese. 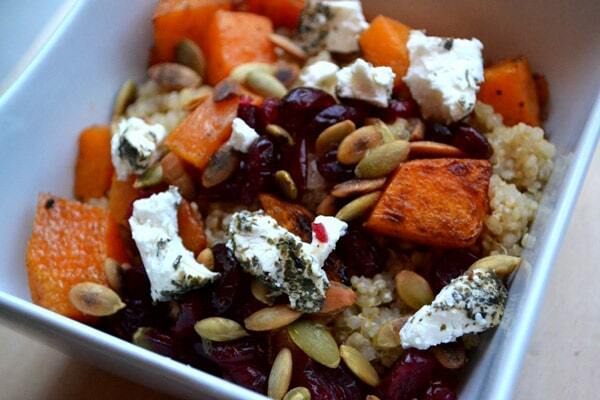 Once your quinoa has cooled down, add the butternut squash, goat cheese, cranberries and toasted pepitas. Add the lemon juice and salt and pepper to taste. This is a delicious combination of flavors! I am a big fan of yours!! been one I didn’t enjoy. Yours are healthy and delicious. I am almost 68 yrs young & still cook for myself, because I enjoy cooking & creating. Also when I cook I know exactly what is in my food. Like you I had a late life princess? really a miracle baby and she has helped keep me young all these years. God bless you and your family.